Shane O’Connor (34X) tries to take the lead away from Dylan Woodling during Friday night racing at Limaland Motorsports Park. 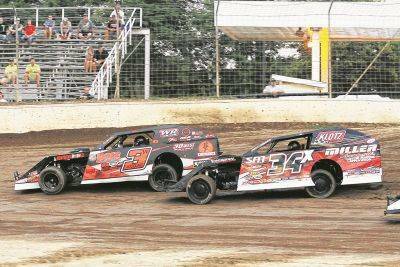 LIMA — Limaland Motorsports Park closed its season Friday night with six races contested on Lock 16 & K&L Ready Mix Night. Dylan Woodling won the 10-lap K&N Filters UMP Modified King of the Quarter Mile with Shane O’Connor finishing second and J-Jerry Bowersock earn third place. Jeff Matheny, Shawn Valenti and Daniel Sanchez were first through third in the 10-lap Bud Thunderstocks King of the Quarter Mile. Jared Horstman was first in the 10-lap Sprints King of The Quarter Mile. Dustin Daggett was second and Randy Hannagan third. Woodling also won the 20-lap K&N Filters UMP Modified Invitational. Todd Sherman was next and Tony Anderson finished third. Andy Welch took the 15-lap Bud Thunderstocks Invitational followed by runner-up Jordan Conover. Keith Shockency grabbed third. Horstman turned in a first-place effort in the 25-lap K&L Ready Mix NRA Sprints Invitational. Hannagan was second followed by Todd Heuerman. This entry was tagged 2. 34X-Shane O’Connor , 2. 7B-Shawn Valenti , 2. 85-Dustin Daggett , 3. 22H-Randy Hannagan , 3. 463-Daniel Sanchez , 3. 95J-Jerry Bowersock , 4. 18-Todd Heuerman , 4. 22T-Tony Anderson , 4. 45P-Brian Post , 5. 18-Ryan Sutter , 5. 23-Devon Dobie , 5. 74-Craig Dippman , 6. 15-Jordan Conover K&L Ready Mix NRA 360 Sprints King of The Quarter Mile (10 laps): 1. 17-Jared Horstman , 6. 22T-Tony Anderson Bud Thunderstocks King of the Quarter Mile (10 laps): 1. 1M-Jeff Matheny , 6. B20-Butch Schroeder K&N Filters UMP Modified Invitational (20 laps): 1. 3W-Dylan Woodling ; 2. 65-Todd Sherman ; 3. 22T-Tony Anderson ; 4. 1-Brenden Rassel ; 5. 95J-Jerry Bowerso, Friday resultsLock 16 & K&L Ready Mix Night[#]-Starting PositionK&N Filters UMP Modified King of the Quarter Mile (10 laps): 1. 3W-Dylan Woodling . Bookmark the permalink.